With an eye on increasing milk production, dairy farmers have spent the last 50 years prioritizing cows who are good milkers. However, this has come with an unforeseen cost– a rise in fertility problems that make it more difficult for cows to get pregnant. Something they must do every year to continue producing sufficient levels of milk. Understandably, researchers have approached this issue by focusing almost exclusively on fertility issues in cows. After all, they are the ones who must get pregnant, and they produce the milk. However, you can’t get a cow pregnant without a bull. Recognizing this, a lab at the University of Florida recently undertook to study bull fertility in an attempt to identify the genomic architecture associated with sire fertility in Holsteins. “There is growing evidence that when you talk about the problem of reproductive performance in dairy cattle, part of that problem can be addressed if we select for bull fertility,” said Francisco Peñagaricano, assistant professor of animal sciences, and UF Genetics Institute faculty member. His lab published the results of their study in a November issue of BMC Genetics. 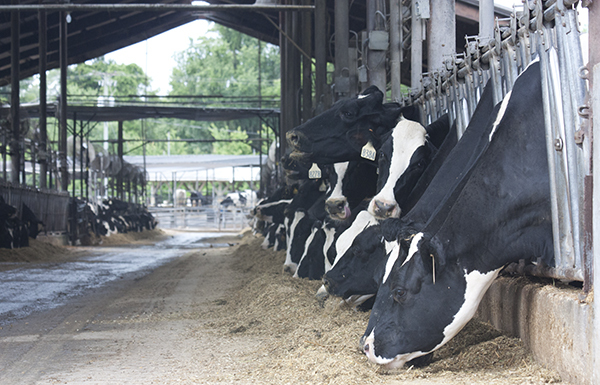 Using data on Holsteins in the U.S. provided by a national registry, they applied alternative genome-wide association mapping studies to various genomic regions, in order to identify possible genomic regions associated with fertility. They found eight genomic regions associated with bull fertility. Most of these regions correspond to genes related to sperm development. “We know nowadays that the problem is mainly in fertilization and early embryo development,” Peñagaricano said. In addition to bull fertility problems, many cows simply have poor eggs. Peñagaricano said researchers theorize genetics could be responsible for as much as one–third of fertility issues. Now that they have analyzed all the available data on Holsteins from the U.S., they plan to move on to other counties and other breeds. However, similarities across breeds further confirm the significance of certain genes. He said breeders are working to correct breeding approaches that led to dairy cows putting almost all of their resources into milk production at the expense of the rest of their body.